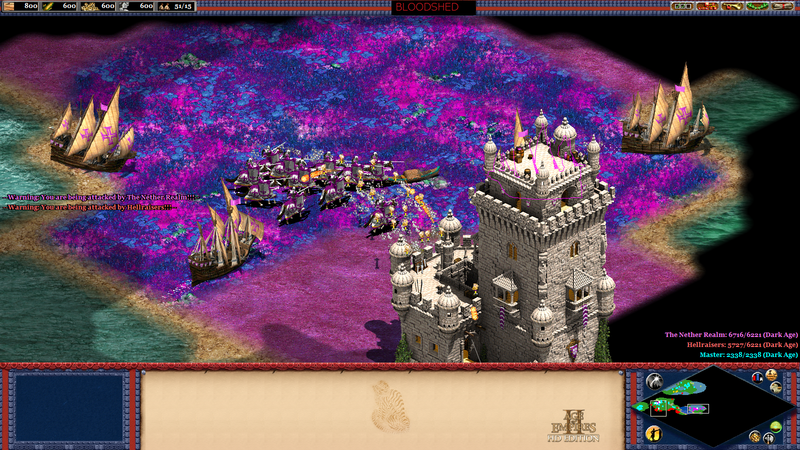 The single largest mod for Age of Empires II HD. Made specifically for The African Kingdoms. Other versions may or may not be supported. This is the release of Age of Bloodshed 1.07. The Blood Ocean texture is included in this release and all future releases. Only if you have Age of Bloodshed 1.061 or lower will you not have the Blood Ocean texture and the other textures. +Stone Mine graphic changed to a larger stone mine. Similar stone graphics standardized as stone mines. +Gold Mine graphic changed to a more realistic piece and now named "Gold Treasure Resource". +Imperial Palace Pike Guard added to Imperial Palace. Activates on Imperial Age. +Imperial Palace should now fire projectiles from random positions inside the spawning area instead of one long line. +Imperial Palace now also has secondary attack. +Paragon added to Barracks. Activates on Research to Feudal Age. +Warrior Monk added to Barracks. Activates on Imperial Age. +Mill, Lumber Mine, and Stone/Gold Mine cost reduced to 60 wood from 100 wood. folder, and replace the music folder with the one from the mod. Credits go to Persefone, In Vain, and Two Steps From Hell. +Colosseum now has a larger, more appropriate sized construction area. +Goth Castle uses Alternate Model. Better looking. +Briton Castle uses Alternate Model. Better looking. +Byzantine Castle uses Alternate Model. Better looking. +Great Fortress Wall replaces the slot where the Outpost was. Expensive, but offers excellent protection. +War Lion added to Stable, activates on Feudal Age. Costs 218 Food. +Dark Age House graphic changed to better looking alternate model. Hit points for houses of all ages increased to 1000. +Fire Tank health and armor slightly increased. Now buildable from Siege Factory as well as Imperial Palace. +Heavy Scorpion now available without research, renamed to Siege Ballista. +Elite Fire Zealot added to Monastery. Activates on research to Imperial Age and research Redemption to enable new unit on button two. +Age of Bloodshed Campaign now has 14 missions. +More music added to Age of Bloodshed. +Grand Monastery is now Administration Building, more armor and more health. +Administration Building can train three types of combat units. +Administration Building CAN NOT be constructed by Villagers. Can only be present in Age of Bloodshed Campaign missions. +Age of Bloodshed Campaign missions should be played on HARD. Some missions may take up to five hours. Don't worry, this is normal. directory or wherever you installed your game. Copy the textures to your directory. Use the readme file there for specifics. Copy the background skins to your directory. Use the readme file there for specifics. Copy the data, slp, and terrain folders to the corresponding folders in the Age of Empires II HD: African Kingdoms directory. Copy the sound folder to C:\Games\Age of Empires II HD The African Kingdoms\resources\_common or wherever your common\sound folder is. Copy the campaign folder to C:\Games\Age of Empires II HD The African Kingdoms\resources\_common or wherever your common\campaign folder is. Start at the Castle Age to automatically have most new units, population cap 500. Set the AI difficulty to Hard or Hardest if you want them to use tactics or the new units. Even if you have a previous version of Age of Bloodshed, overwrite all the files. Some new files are NECESSARY FOR THE CAMPAIGN.